Tom Lace top scored with a career-best 83 as Derbyshire posted 256 for seven on the opening day of the County Championship match with Gloucestershire at Bristol. 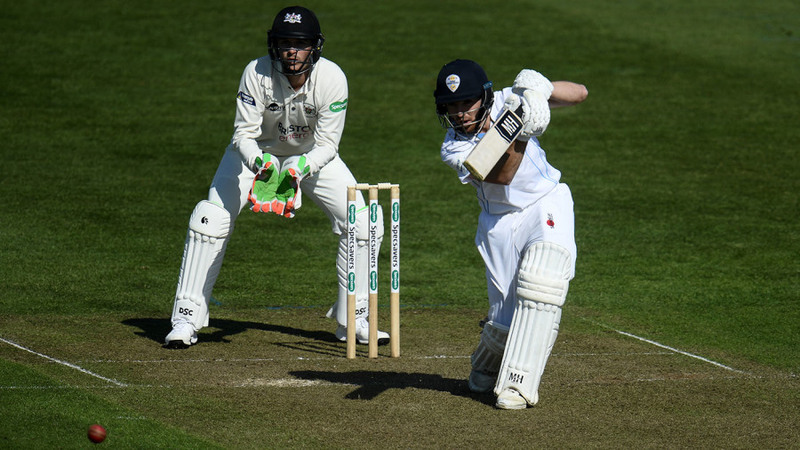 Lace, a 20-year-old playing only his seventh first class match, hit 16 fours in facing 127 deliveries to better the 61 he made in the second innings of the previous game against Durham. Opener Luis Reece contributed 39, batting through the morning session, while Harvey Hosein (41) and Matt Critchley (34) produced a sixth-wicket stand of 71 to assure Derbyshire of a meaningful score. Ryan Higgins was the pick of the home attack with two for 37 from 23 overs, while Josh Shaw claimed two for 61 and Matt Taylor two for 75. A bright, but cold day began with Gloucestershire winning the toss and electing to field. They made a breakthrough with only 16 runs on the board when Higgins bowled Billy Godleman, attempting to drive, for seven. Wayne Madsen helped Reece take the total to 48 before falling lbw to a full delivery from left-armer Taylor, who bowled with little fortune, while Higgins' opening spell brought him one for eight from seven tight overs. It was 72 for two at lunch, Reece having moved to 27 and Lace on 20. Soon the scoreboard read 95 for three as Reece edged a back foot defensive shot off Shaw through to wicketkeeper Gareth Roderick. Lace reached an 89-ball half-century with his tenth four and was looking increasingly confident as he and Alex Hughes put on 73 for the fourth wicket. It was a surprise and a major disappointment for Lace when, 17 short of a maiden Championship century, he nicked a low catch to the diving Roderick and became a second victim for Taylor. The batsman's frustration was evident as he walked off with the score on 168 for 4. \"It was great to go past my personal best score for the second time in successive innings,\" Lace said. \"Having played a lot of second team cricket at Middlesex, to be able to take part in and contribute to first class matches is fantastic for me. \"I am loving every minute. It was frustrating to get out when I did, but it was a good ball from Matt Taylor, who I thought was their most threatening bowler.\"
Gloucestershire's bowlers kept chipping away and struck again with only two runs added at the start of the final session when Hughes, on 26, edged Higgins to first slip where Benny Howell took a low catch. But the busy Hosein had settled in impressively and Critchley helped see off the second new ball. Both looked in good touch until Critchley was lbw to Shaw, moving across his stumps to make it 255 for six. The following over saw Hosein bowled by Benny Howell late on his shot as Gloucestershire finished an evenly contested day strongly. With Dan Worrall, David Payne and Stuart Whittingham missing through injury, the home side gave a Championship debut to 19-year-old seamer Harry Hankins, brother of batsman George Hankins, who was also in the side. The youngster's first ball was directed wildly at second slip, but he gathered himself to finish the day conceding 50 runs from 15 tidy overs.